Independence Day, fireworks, barbecues, a celebration of America’s independence as a nation, right? Leave it to Calvin Demmer to add a little darkness to a day meant to bolster the spirits of a nation who fought hard for this day so long ago, proving that just maybe we should treasure each holiday, because who knows when it will be the last under his dark and twisted little pen? 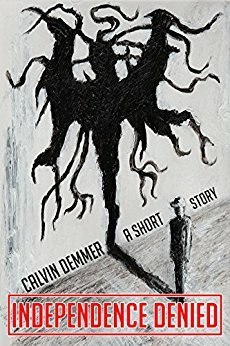 INDEPENDENCE DENIED is a wrap for Mr. Demmer’s Dark Celebrations series of short tales that leaves no celebration unscathed and what better way than to go out with a major bang than to rain on those awe-inspiring fireworks? For Brad Marshall, it was work as usual until the underwater camera he was monitoring gave him a glimpse into a mystery beyond imagining as the rest of the world faces one disaster after another. Suffice it to say, Calvin Demmer has deftly given me the creeps in just a few short pages, once again, forcing me to stay up past midnight just to make sure July 5th comes on schedule with no surprises! I'm pretty sure I'm glad he doesn't know when my birthday is, too! I received this copy from Calvin Demmer in exchange for my honest review.